Litters...We have lab puppies now! As a breeder, I breed for myself to keep the best show potential pups. Sometimes it is one pup and sometimes I keep a certain amount of the puppies to be evaluated at a later time. The rest of the litter is then sold after I have decided on my picks. After I pick my pups at 8-10 weeks old, then the puppy buyer can pick theirs on a first come first serve basis. There usually is a waiting list and this is how I determine who will pick after me with my guidance. I will not place a puppy with a family or person that I feel will not suit their lifestyle. I want to talk to you before I sell you a puppy . At times, but not frequently, some of our black puppies will be born with a white spot on its chest. This is part of the heritage of the Labrador Retriever. It does not diminish the quality of your pet. It is within the AKC breed standards. I take deposits on the pups ($500) and often have all the pups in a litter sold before they are born. Deposits are NON-REFUNDABLE. The only time it is refundable is if I do not have the color or gender available that you request. All pet puppies are sold on AKC limited registration. Well-bred labrador puppies in this area range between $2000-$3500. Our prices starts @ $2500. We highly recommend when purchasing a puppy that you also purchase a pet insurance policy for the first two (2) years of the puppy's life. With the rising costs of veterinary care it does come in handy for any injuries or illnesses that can come up in a puppy's life. All our puppies are raised in our home. All pups leave our home with age appropriate vaccinations, several wormings, heartworm preventative, and flea/tick preventative. There has been a recent study by UC Davis on early neutoring and spaying that contributes to hip dysplasia. Studies have proved growth plates are not closed until two years old. We recommend that all our puppies NOT be neutored before the age of two years old. 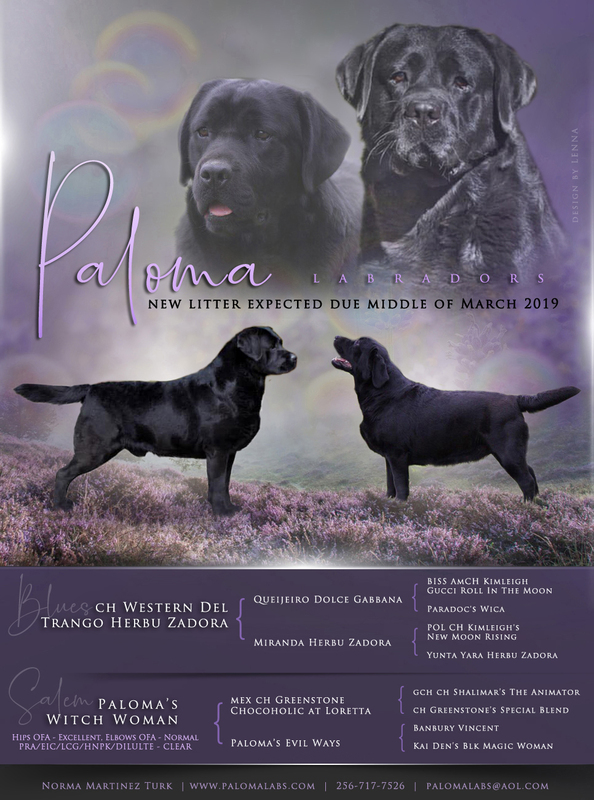 Paloma Labs regrets that we will no longer be able to ship puppies. All puppies sold must be picked up in person.